If you look at today’s mileage, you’re probably wondering what went terribly wrong. Actually, we are exactly on our scheduled itinerary and I’m so thankful to Rockin’ for doing her research and knowing this stretch would be time consuming and giving us a “short” day today. It was short in mileage, but definitely not in effort. Guidebook author, Roper, warns that this section is “tricky” as far as navigation, and that proved true for our first half of the day. First off, we had a canyon to drop down, but there were a lot of warnings about it being tricky and possibly involving many small class 3 cliffs. Fortunately, we had the secret weapon of Rockin’ who had been here before. She remembered needing to contour way over to one side to possibly avoid the cliffs and she was right! Rockin’ assessing the route down. What’s difficult to see from the photos is how time consuming this section was. There was a lot of time spent studying the maps, using trial and error, and rereading the guidebook to dissect each direction. Why Not coming down the rock shelves. Why Not and Rockin’ on talus. With less obvious physical landmarks and knowing this section was tricky, I was very quick to use the GPS today. It worked in our favor some of the time and other times, we became too complacent with it and didn’t pay close enough attention and went the wrong way for awhile before realizing it. I’d say we spent at least 1.5hrs of the day today going the wrong way and backtracking. That’s why the data book mileage I listed for the day doesn’t indicate truly how much work we put in. Our goal for the morning was to make it down to the Twin Lakes. The one noted deep ford is at the outlet of one of the lakes. We were prepared for something more harrowing, but it turned out to be deep, but not swift. It got up to about my waist and had really slimy slippery rocks on the bottom. 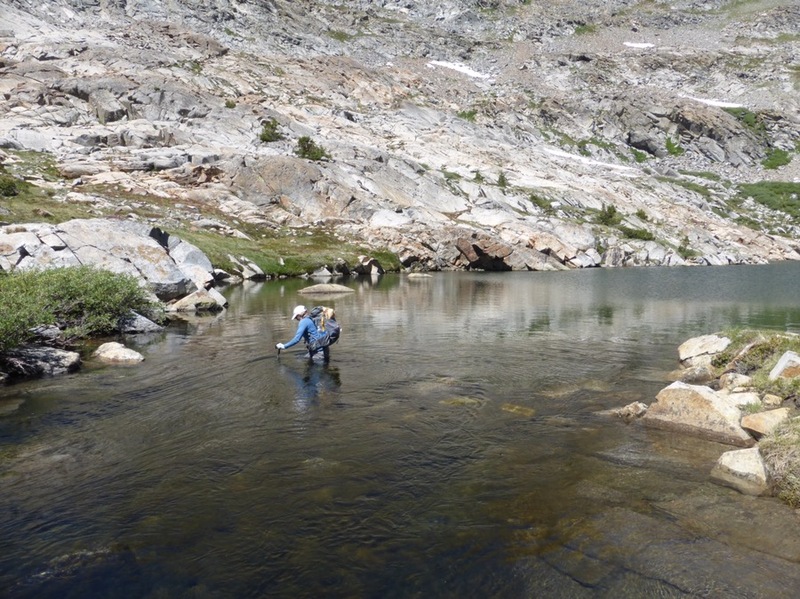 Fording the outlet of Lower Twin Lake. Hiking from Lower to Upper Twin Lake. After the ford, we had lunch at Upper Twin Lake and did our calculations. It took us about 6hrs to make 1.7mi according to the data book. Yep, that’s the SHR for you. We did more hiking than that with all the route finding, but apparently, we only made 1.7mi of progress on the actual route. 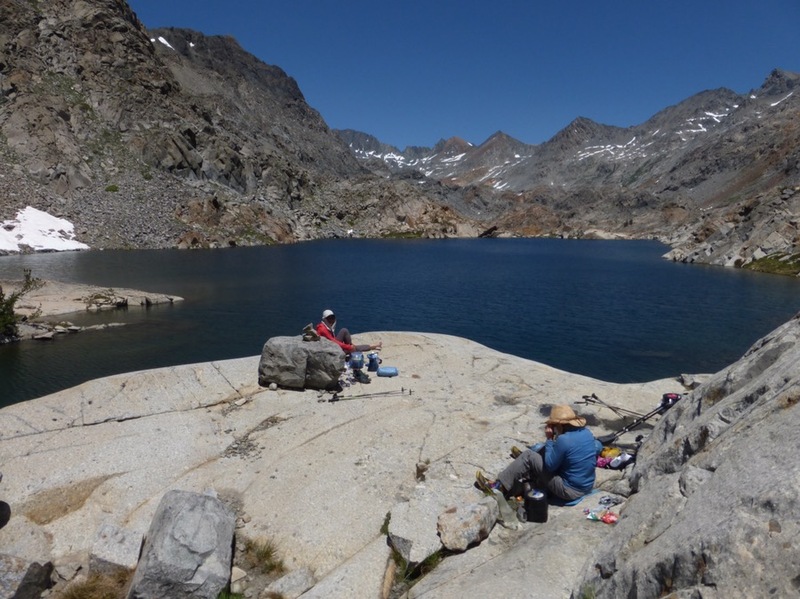 Lunch at Upper Twin Lake. Fortunately, the second half of the day was much more straightforward. 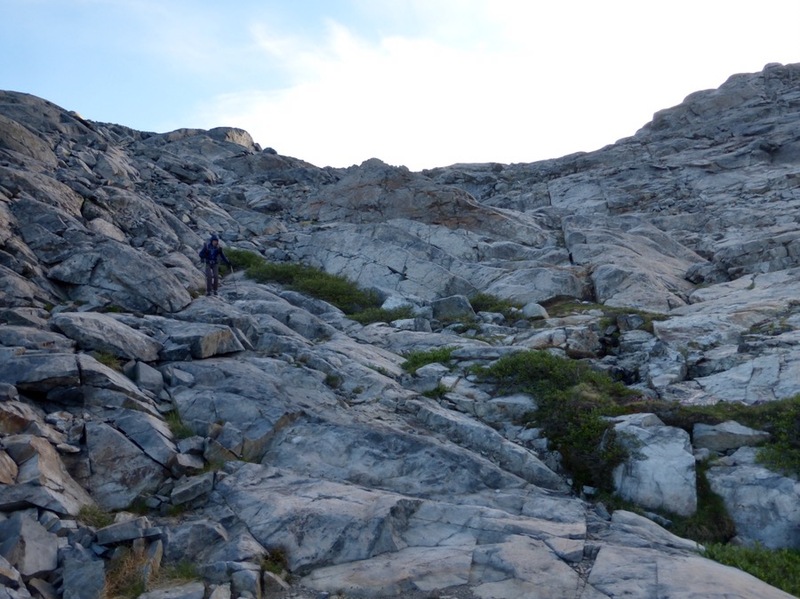 We had a talus traverse before dropping down into Bench Canyon. 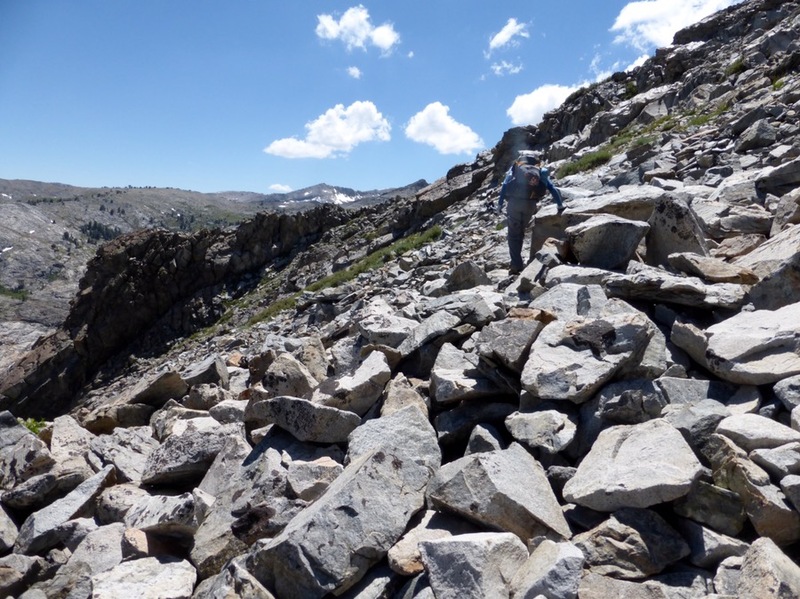 Why Not on the talus traverse. 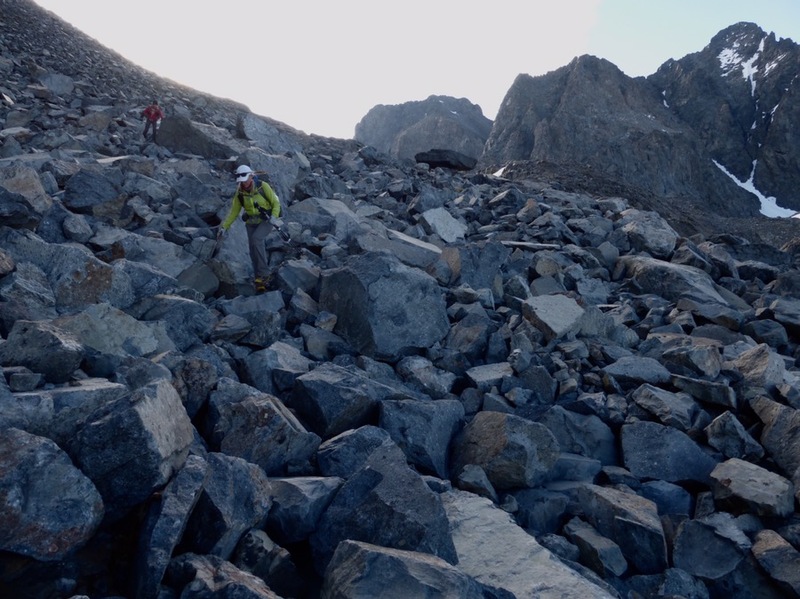 Rockin’ on the talus traverse. This may be my favorite stretch of the SHR. It is a meadow wonderland. We hit it just before the full bloom of wildflowers, but did get some. Plus, we are still super lucky with the few mosquitoes that have been out. Rockin’ compared it to a golf course with how perfect the grass was. We all felt like it was like Disney World with the perfect placement of everything and streams running through it. Even the guidebook author, Roper says, “Amid such splendor, it is nearly impossible to avoid cavorting like a child.” It was difficult to capture on camera, but it was pretty great. 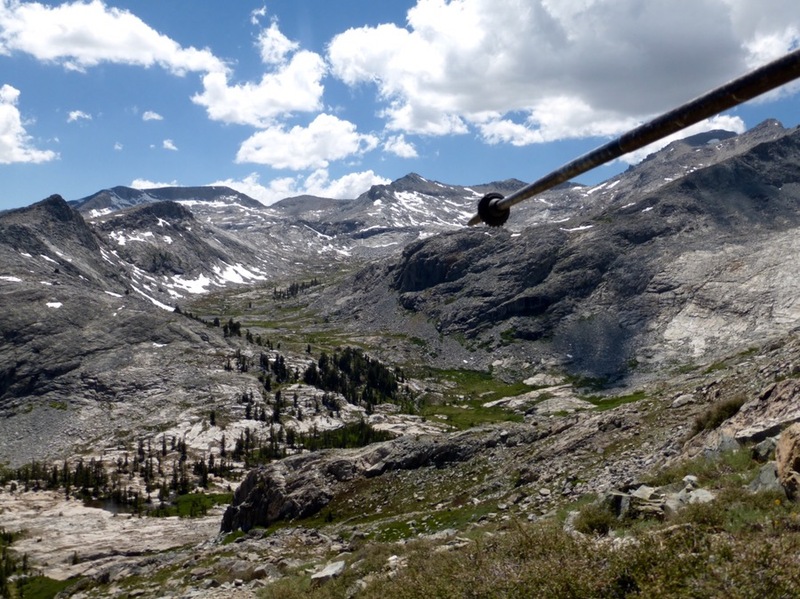 Looking down on Bench Canyon and pointing to our endpoint for the day at Blue Lake. Heading up Bench Canyon toward Blue Lake. 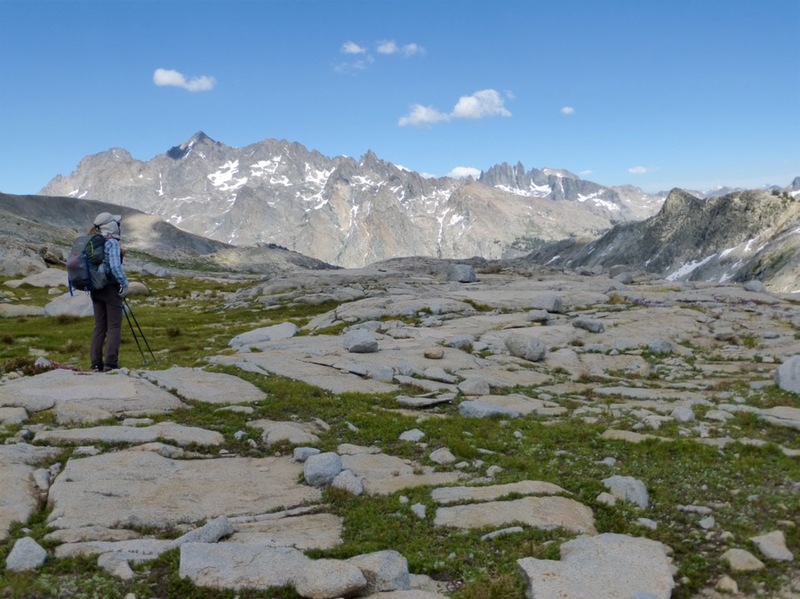 It was really enjoyable to still be off trail, yet be walking in such relaxing terrain on nice smooth grass and granite slabs. Some clouds moved in and the wind picked up a bit again like last night. It’s been cooler temps the last couple of days with temps in the 60s and 70s and a breeze to make it seem even cooler. 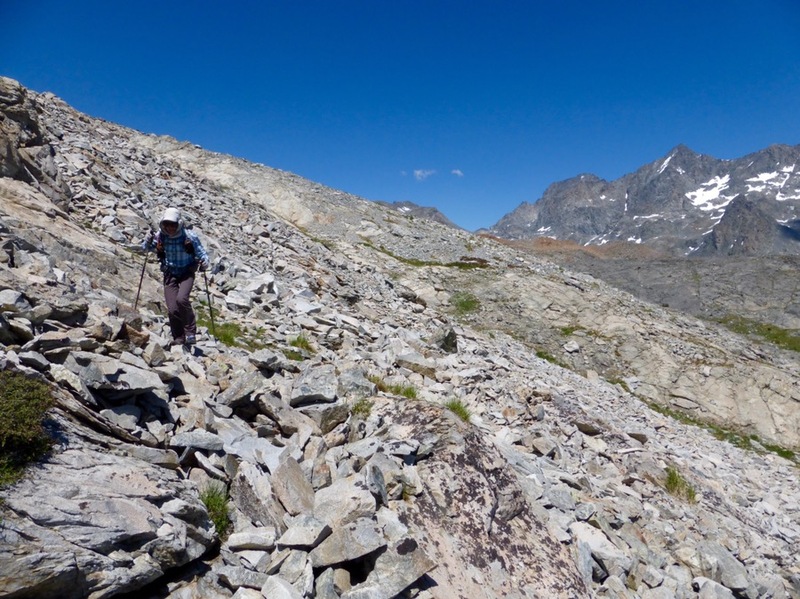 When we looked back on where we came, we got a special treat of a view of the whole Ritter Range that included Banner, Ritter, and the Minarets, which we’ve seen from almost every angle as we’ve hiked around the range. Ritter Range. 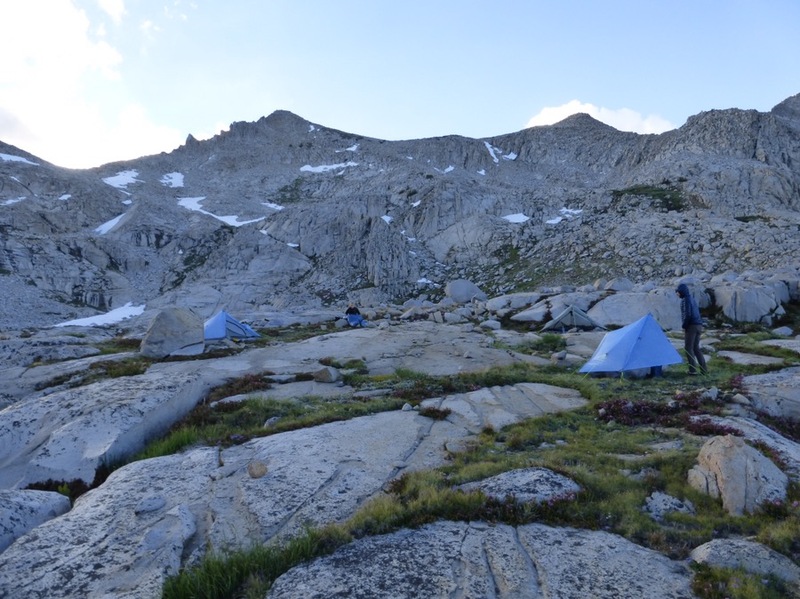 Banner is the first peak on the left, Ritter is second, and the Minarets are on the right. We got to today’s destination of Blue Lake at 4:45pm and had a decision to make. 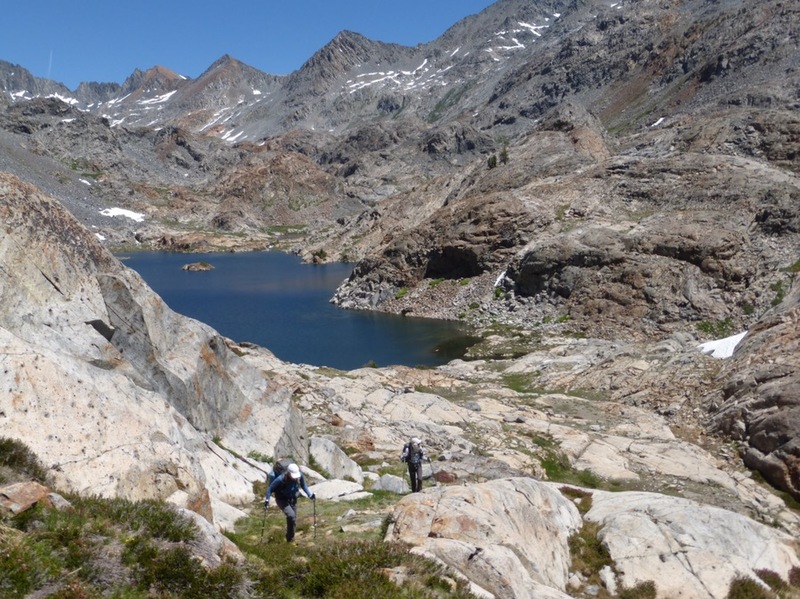 Hike up over the pass (which could take a couple hours) and roll the dice on good camping…or stop early and stay at the picturesque Blue Lake. We discussed the pros/cons of stopping early (which is what we have on the itinerary) and agreed that it was worth staying. 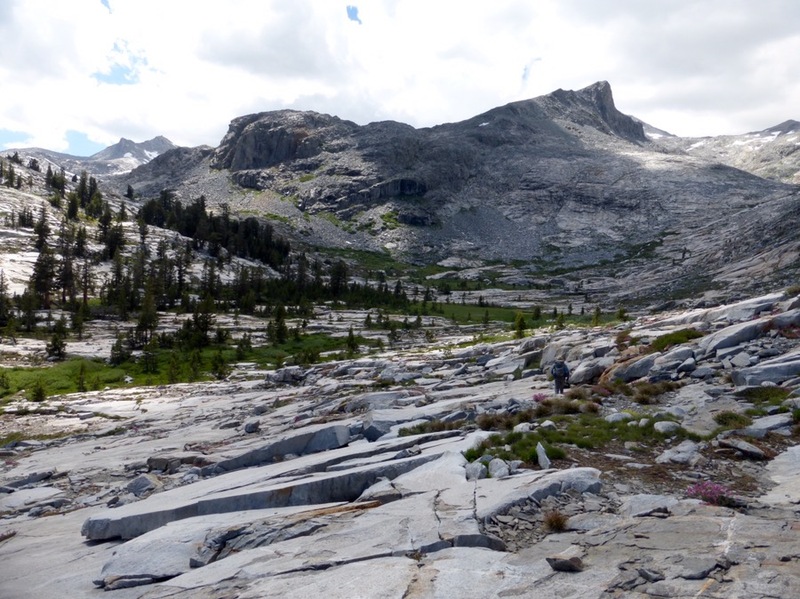 If we moved on, it would put us in a bind because we are headed to Tuolomne Meadows (very much a tourist and backpacker magnet in Yosemite where our resupplies are) and moving on would position us to land there on a Saturday night instead of Sunday morning. We wanted to get there Sunday morning and avoid camping there, so stopping early tonight lined us up perfect for that. 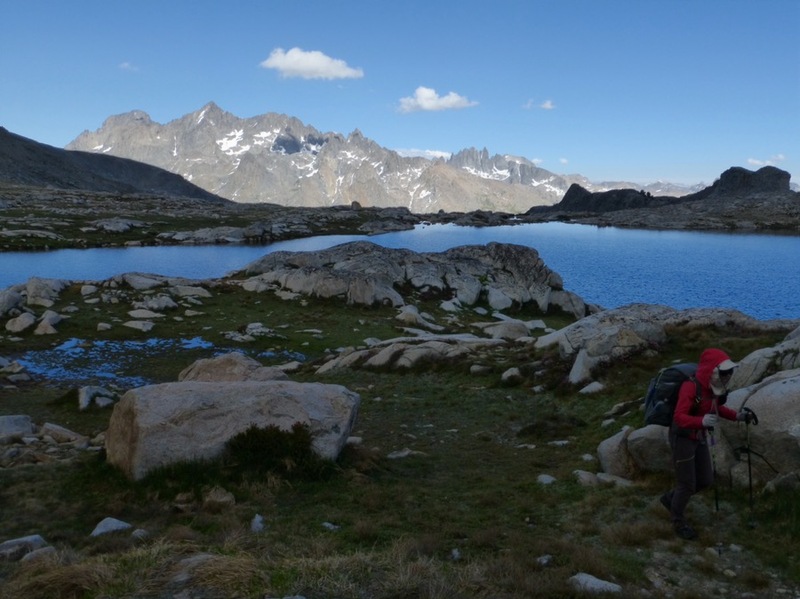 We decided to hike up to the Upper Blue Lake so we could camp with a view overlooking Blue Lake and the Ritter Range. Blue Lake and the Ritter Range. Blue Lake Pass, which we will do tomorrow is the pass on the right with the cloud. Although, it’s not like me to stop this early, this route is all about taking in these spots. This is a remote place that we worked hard to get to and this may be the best campsite any of us have ever had. Plus, I am spent (started my period) and going to sleep early is going to be awesome! 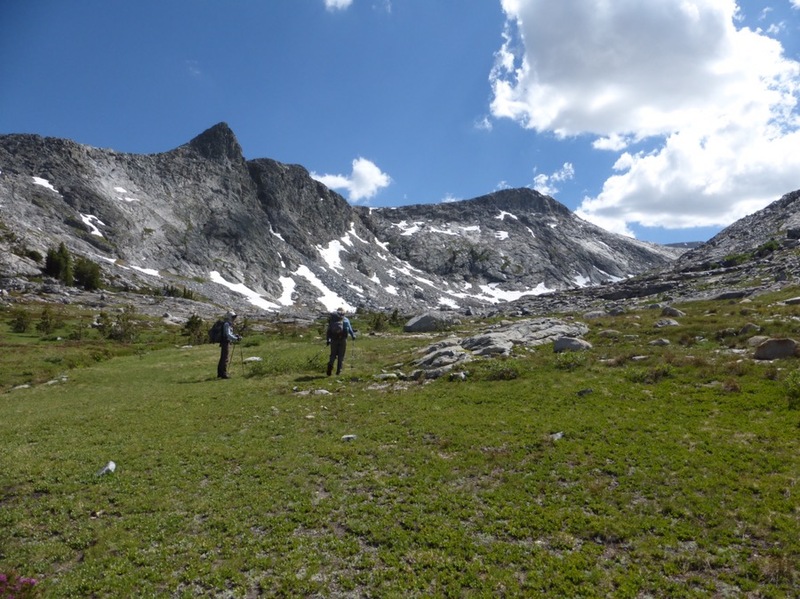 Tomorrow, we will be mostly on trail cruising towards Tuolomne Meadows, so our 10-15mi/day average won’t be a problem. Oh MY! These pictures, from these past two day! WOW. Thanks for putting in the effort to share this stuff. Much appreciated! Ditto Paul, “thanks for sharing”! The time and detail that goes into your narrative is wonderful to read. It does put me “there” with you three. Thanks so much, Wired. And yes, you are looking so solid on the steepest pitches. Congrats. Charge on! Thanks Jean! Good that I can look solid despite the panic in my head at times, hehe…Yes, very time consuming, but I know all this is worth documenting and will only be more valuable to me as the years pass. This will be a memory maker. I could handle hiking on the benches and through the backcountry golf course. I love all the green and granite. Just stunning. Your strides in country like this are amazing. I’m glad that it is becoming more familiar and comfortable for you. 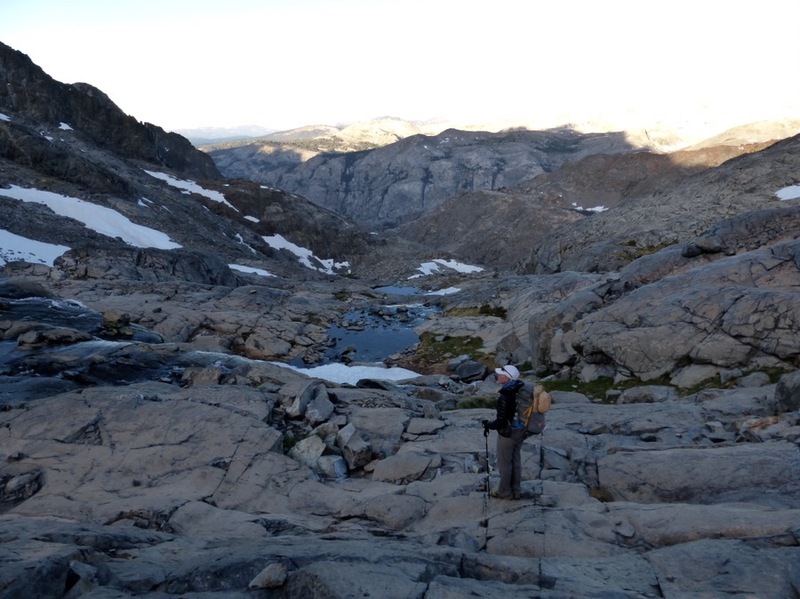 I finally leave for the Emigrant Wilderness tomorrow. Will catch up in a week when I’m back. Oh cool! Have a great trip!